So, actually walked outside today for a change. It helped that the temperature is pretty moderate, the humidity better than normal, and a nice breeze blowing. Oh, and the trail is very shady. That’s right… I said trail. Supportive Partner Woman (Getting serious!) and I have noticed a walking trail a few miles from our house for the six years we’ve been here. About damn time we used it. There’s a nice parking area near the county’s public safety training facility, along with some public restrooms (which we did not have to use) and easy access to the trail. The trail itself is well-maintained. Mostly gravel and cinders, with some muddier spots for good measure. The weeds are well-controlled and the bugs were not bad. It parallels the creek for a portion and it’s nice to stop for a minute and hear nothing but the birds and the rushing of the water. It also runs along some farms and pastures, so even though there are portions with more “fresh country air” than others, it’s not so bad. 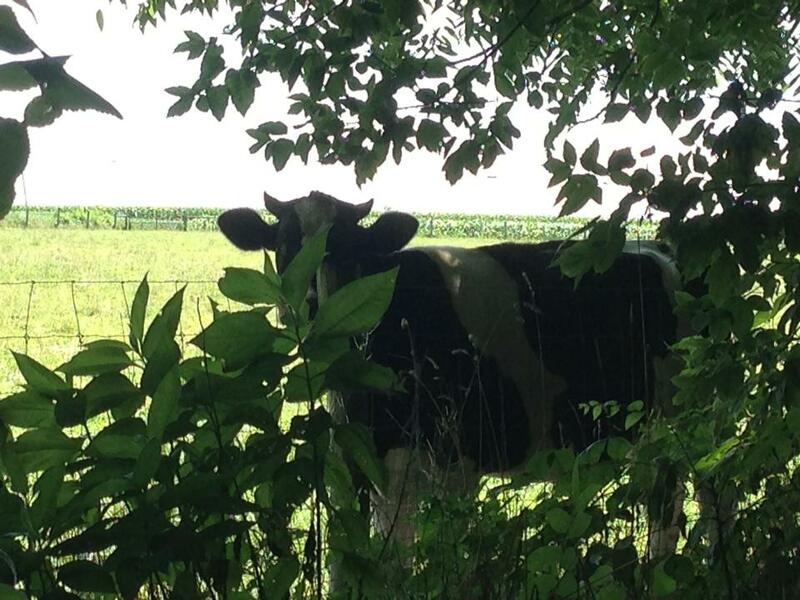 Plus, you get a curious bovine checking you out, not to mention multiple chipmunks and other fauna. The best part about the trail is that it’s flat and there’s plenty of places to break into a jog. We managed to do that several times. SPW even managed to capture some video. I warn you, it’s not pretty and you can see how my feet problems have caused my right foot to go to the outside to compensate for the missing toe. Here’s the 12 seconds in all it’s glory. Like I said, it’s not pretty, but it will improve. Practice! Quick note… I’m pleased to start working with my Team AllEars mentor, Rich. I look forward to learning from him and getting the benefit of his experiences with various running events. Thanks in advance, Rich! Again, please consider donating to the Avon Walk. My personal fundraising page is located here. At any rate, that’s about it for today. Hope you all have a great weekend!